K-pop group Crayon Pop scored their first TV music chart award for their viral song "Bar Bar Bar." The group performed the song on KBS "Music Bank" on Aug. 30. Crayon Pop and EXO were the nominees for the top spot but in the end, Crayon Pop won with 5,770 points against the boy band's 5,677. The award is memorable as this is Crayon Pop's first ever music chart award since debuting in June last year. 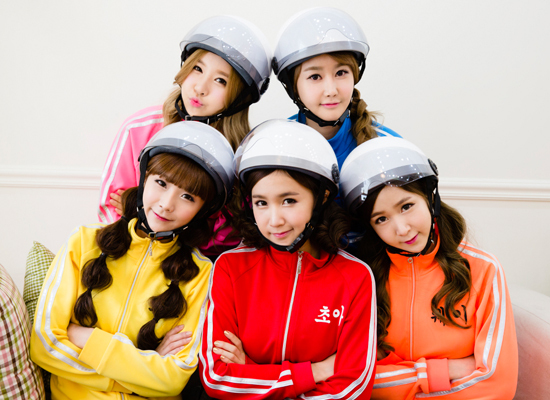 Crayon Pop's popularity is mainly because of the music video for "Bar Bar Bar," which features the "Straight Five Engine Dance" where the girls jump up and down to simulate car engine cylinders. In the music video, the members are wearing colorful outfits and helmets that are similar to the costumes of the main characters in the TV series "Power Rangers." However, the "Bar Bar Bar" music video has been blocked on YouTube by Crayon Pop's own labels. This morning, the music video is no longer accessible on the girl group's official YouTube channel due to copyright claims by Sony Music Entertainment and CJ E&M Music, which are Crayon Pop's labels. "This video contains content from SME and CJ E&M Music. It is not available in your country," according to the notice that replaced the music video. The music video, uploaded in June, had accumulated 3.8 million videos before it was blocked. K-pop entertainment site Allkpop reported that the music video has been blocked in the US, Spain and the Philippines. And it is apparent that the music video has been totally blocked. Fans on the site also commented that the music video has been blocked in Vietnam, New Zealand, Hong Kong, Japan, Portugal and other countries. CJ E&M Music is Crayon Pop's label in South Korea. Earlier this month, Sony Music Entertainment signed up Crayon Pop to its label under an album licensing and partnership contract with Chrome Entertainment, the girl group's agency. The "Bar Bar Bar" music video can be viewed on CJ E&M Music's official YouTube channel. Sony Music Entertainment and CJ E&M Music have yet to issue any statement regarding the reason why they blocked the music video on Crayon Pop's official YouTube channel.